The Main Battle Tank Is a Killer on the Battlefield. Yet, some Countries Want to Replace It. While the Main Battle Tank has dominated ground conflict for almost the last half century of wars, it is a very costly machine in many aspects. MBTs take a lot of resources to deploy, operate, and procure due to their heavy armor and weight. They are often not very strategically mobile, requiring shipping on ships as opposed to aircraft. As a result, in the past thirty years, many concepts have been put forth as MBT replacements or supplements in the form of a versatile gun on a lighter wheeled or tracked chassis. This article will discuss Polish, American and South African attempts to develop such vehicles. One of the first concepts of an MBT “replacement” came in the 1980s from the United States Marine Corps. A new concept of a rapidly deployable task force came about, and a new Light Armored Vehicle (LAV) would be required to equip such forces. The request for proposal asked for both an infantry carrier armed with the twenty-five-millimeter Bushmaster cannon, and an assault gun variant with a ninety-millimeter Cockerill cannon. A variant of the MOWAG Piranha, submitted by GM of Canada, won this competition in September 1982. The Marines began developing the assault-gun variant (now called LAV-AG in accordance with the other variants of the LAV adopted) further. Additional weapon systems were tested to provide increased firepower relative to the ninety-millimeter Cockerill. However, only a modified version of the M68 105-millimeter gun, the same gun that was on the USMC’s M60 Patton MBTs, was found to provide sufficient firepower for its role. Technical limitations meant that this gun could only be fired in a sixty-degree frontal arc of the LAV. This was deemed insufficient, and the LAV-AG was scrapped for the time being. It was revived in 1987 when GM trialed a new autoloaded 105-millimeter EX35 cannon on the LAV chassis, designated LAV-105. This variant passed Marine Corps trials, but procurement was put on hold following the end of the Cold War defense budgets in 1991. It was briefly revived in 1993; however, nothing came of it in the end. This marked the end of a potential LAV-AG, and nowadays LAVs serve primarily in a reconnaissance role in the USMC, reflected in the name of the units they are assigned to, Light Armored Reconnaissance Battalions. Despite the failure to fully implement the LAV ideal, the concept of a more rapidly deployable, yet still armored force was still of interest to the United States. While the U.S. Army first flirted with this concept by attaching itself to the USMC’s LAV program back in the 1980s, it left the program early on. Rather, the Army laid the foundation for its MBT replacement in the late 1990s, when Gen. Eric K. Shinseki, then Army chief of staff, laid out the plans for the “Objective Force,” which was to be more mobile and rapidly deployable than then-current units. One of the important parts of this was the “Future Combat System,” which was their “MBT replacement.” It was to be a vehicle, not weighing more than twenty tons (so as to be air transportable in a C130), that matched or exceeded the survivability and lethality of the Abrams Main Battle Tank. However the technology for this Objective Force was not yet ready, and thus the Army planned to field an Interim Force that could also be rapidly fieldable, consisting of existing technology. Again, a variant of the MOWAG Piranha won, and was designated the Stryker. However, the assault gun based on this platform, the Stryker MGS did enter service following successful testing, mounting an autoloaded M68A2 105-millimeter cannon. However, many compromises for weight were made in the MGS’s design. No climate-control system meant the crew had to wear cooling vests. No armor was placed on the gun module, meaning it could be easily disabled in combat. As a result of these compromises, the MGS had a very limited production run of fewer than 150 vehicles, proving to be not very effective at supplementing MBTs on the battlefield. However, some nations have successfully fielded wheeled MBT supplements. 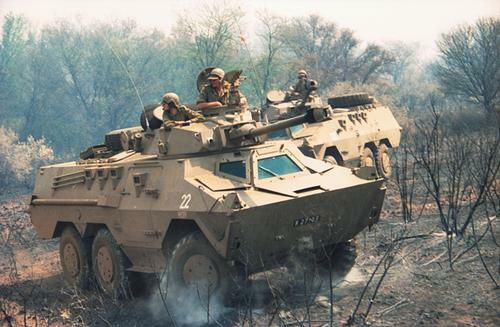 Notably, the Republic of South Africa, throughout its border war with Angola, fielded the Ratel series of IFVs. Similar to the original LAV concept, the development of these vehicles in the 1970s preceded the USMC’s LAV concept (and probably partially inspired it). Lightly armored and mounting a variety of armaments from twenty-millimeter autocannons to a ninety-millimeter gun in the Ratel 90, the Ratel series was designed as an upgrade from earlier armored trucks used in the Border War. The Ratel 90, in particular, proved to be a very effective MBT supplement. Compared to the Olifant MBTs (upgraded British Centurion tanks) in South African service, the Ratel 90 was able to travel more quickly across the wide African terrain and incur fewer maintenance costs and downtime. In combat, they effectively engaged Cuban and Angolan T55 tanks, although their ninety-millimeter cannons were only able to penetrate from the side. While the Ratel 90 is largely obsolete by today’s standard, with the SANDF replacing their Ratels with the Patria AMV, it proved that wheeled MBT supplements can effectively fight a COIN war, and even serve a limited role in force on force mechanized conflicts. While wheeled MBT supplements have seen success, some nations have pitched the idea of lighter vehicles with full power tank guns as MBT replacements. Poland notably has been considering these ideas, as they grapple with their aging fleet of T-72M1s and PT-91s. One of these vehicles is the “Anders” light vehicle, which mounts an autoloaded RUAG CTG 120-millimeter gun. Other features include engine exhaust-cooling systems, to decrease its thermal profile; Zaslon or Trophy APS, so that its relatively light armor is less of an issue; and a laser warning suite. Anders is designed to be readily transportable by rail and air, in a common theme for MBT supplements and replacements. Poland is also experimenting with wheeled MBT replacements, on their “Rosomak” (license-produced Patria AMV) chassis. One concept was displayed at MSPO 2015, mounting a different version of the same RUAG 120-millimeter gun in a full turret. At MSPO 2017, this concept was further developed, with APS mounted as well on this platform. Notably, the 120-millimeter gun supports the Falarick Gun-Launched ATGM, giving it standoff engagement capability. An important disadvantage to these Rosomak-based MBT replacements is their extreme height. At 3.6 meters tall, they present a higher profile than the tanks that they are meant to replace, which could prove a significant disadvantage on the battlefield. The most famous MBT replacement to come out of Poland is probably the PL-01. Its sleek angles and nonconventional “stealth” design make it highly visually distinctive. It also is fairly advanced internally. Similar to the T-14 Armata, the turret is totally unmanned. It sports an autoloaded 120-millimeter gun, providing it with equal firepower to most MBTs. The “advanced stealth features” consist of RAM materials, engine exhaust temperature management and thermal camouflage. However, its largely accepted that most of these stats are only on paper, and the tank “as displayed” is largely “cardboardium,” and a lot of time and funding would be required to get it anywhere near a workable state. Information about the LAV and Stryker programs was taken from Armored Car: A History of American Wheeled Combat Vehicles by R. P. Hunnicutt. Information about the Ratel was taken from South African Armour of the Border War 1975-89 by Kyle Harmse and Simon Dunstan. Additional research assistance was provided by Michał Kizeweter.